National Root Beer Float Day is August 6, but we don't need some silly declaration to appreciate the retro dessert. Looking for a place to pick up the beloved novelty? Here are five places in Austin that do stellar interpretations of this American ice cream classic. Flat Top's Black Cow root beer float is made with Texas-churned Blue Bell French vanilla ice cream, Black Cow root beer, a dollop of whipped cream and a preserved red cherry. Manager Neil Rubenstein uses Blue Bell ice cream as the base because of its rich custard flavor. 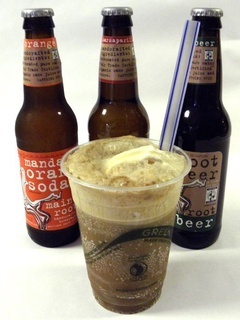 To revive the vintage roots of the famous treat, Rubenstein began researching and discovered that gold miner Frank Wisner made the very first root beer float with Black Cow root beer and from-scratch ice cream in 1893. Made with Maine root beer and in-house soft serve, Cow Tipping Creamery features a unique twist on this sweet classic. The dairy used in the float is organic and sourced from non-HMO, grass-fed cows and comes in either Madagascar or Tahitian vanilla flavors. Root beer floats aren't on the permanent menu at this Austin burger joint, but P. Terry's owner Patrick Terry says diners can always request one at any location. Those who crave a near copycat of this dessert often order P. Terry's root beer shake, made with vanilla ice cream and Maine root beer syrup. "We originally offered the root beer shake for a limited time, but the overwhelming response when we ended the promotion was so strong that we kept it on the menu permanently," Terry says. The 16 oz. shake sells for $2.